Can health programmes be designed to deliver care to last mile communities and also operate as sustainable enterprises? Traditional hospital-based services are not able to reach some of the world’s poorest and most remote villages. Over one billion people globally, including 400 million Africans, lack access to health services because they live too far from a health facility. Rural communities know that if a child becomes ill, the long walk for treatment could potentially turn a minor ailment into a serious health problem. 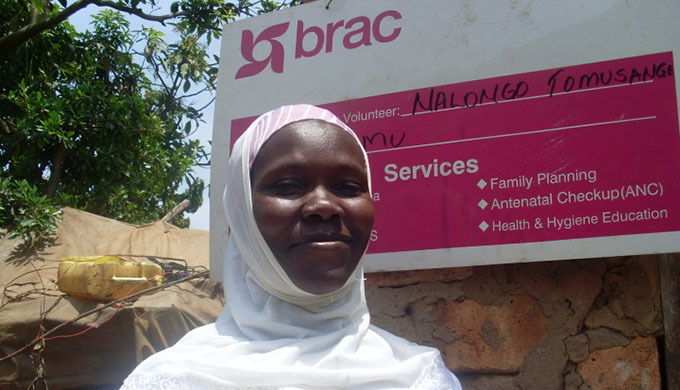 Nalongo Tomusange, a BRAC community health worker outside her office in Wakiso district, Uganda. Distribution of healthcare products in hard-to-reach markets presents a huge challenge which providers are eager to meet; Cola Life uses Coca-Cola and other commodity producers to open up private sector supply chains for ‘social products’ such as oral rehydration salts and zinc supplements. BRAC has always believed that you need to take healthcare out into the community. Our model successfully delivers sustainable and accessible healthcare in some of the poorest and most remote communities in the world. Community health workers, local women that are selected and trained by BRAC, go door-to-door offering basic curative services and products for family planning, deliver health and nutrition education and refer cases of HIV, TB and malaria to local health facilities. Local health workers know their communities the best and are best placed to engage with them on personal and family issues. Our model currently costs money to operate. Funding generously donated from partners and donors enables us to empower women like Nalongo, 41, a mother of six living in a rural village in Uganda to work for herself as a micro-entrepreneur. BRAC makes central purchases of high quality low-cost health products, enabling a mark-up for our health workers, whilst also delivering an affordable health solution to families in remote communities. Health workers earn between USD 20-25 a month, which is crucial to ensure the sustainability of the programme but also supports women like Nalongo to build their lives. Nalongo has managed to save and tells us she has “used that to educate my children; my triplets are now in Form One. I have bought a piece of land and I am now saving to build a house.” She believes that improving health begins at home and works with us to raise awareness in her local area with a focus on antenatal and postnatal advice. Recently, in partnership with Living Goods we have been building on our micro-entrepreneur model to reach the shared goal of reducing under-five mortality by 15 per cent in target areas. Our goal is to build a fully financially sustainable social enterprise model to deliver healthcare especially to last mile communities and those at the bottom of the pyramid. This model will generate revenue that pays for the products, provides higher and more motivating incomes for the health workers, and covers the distribution costs. Early evaluations have shown that our partnership has successfully reduced under-5 mortality by 20 per cent in the communities that we operate in and prompted a drop in prices for medicines. Currently the model recoups 100 per cent of the product costs, the promoters earn a motivating income and the wholesale margin covers a proportion, but not all, of the running costs. With continued funding and with the strength of the partnership yielding beneficial cross learnings we hope to demonstrate to the global health community that an entrepreneurial, integrated community health network at scale can deliver impact at very low cost. If you are working to try and deliver healthcare to remote communities and have any insights, tips or experiences to share with our team we want to hear from you. Katie Allen is the communications and marketing manager at BRAC UK. Adepo Emmanuel Okaalet is the communications manager at BRAC Uganda. Health workers earn less than $1 a day? and can save money?